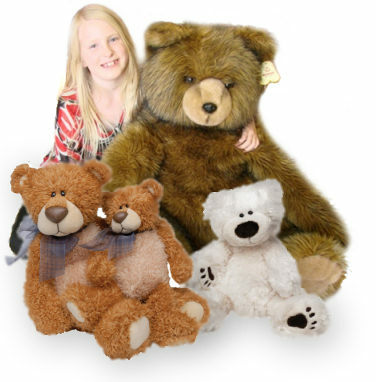 Teddy Bears at Stuffed Safari - Stuffed Teddy Bears and Plush Teddy Bears in all sizes, styles, and colors. For over a century, stuffed teddy bears have been a favorite toy, a best friend, and a trusted confidant for both the young and the old alike. Stuffed teddy bears are one of the toys that people are most likely to keep from their childhood, and are also one of the items most likely to become the center of a most treasured collection. Stuffed toy bears have been dated back as far as 1894 (perhaps even further), but the true beginning of the 'Teddy' bear came towards the end of 1902, when a now famous bear hunting incident between President Teddy Roosevelt and an injured black bear cub became the focus of a political topic in some of the newspapers of the day. By November of 1902, stuffed teddy bears had hit the American market, and they have never looked back. The teddy bear has been an active part of many moments in history, from the inspiration of the famous song "The Teddy Bear's Picnic", to a mourning gift passed out after the sinking of the Titanic. Teddy bears were also there in 1919 when the world's first non-stop Atlantic flight was made - Alcock and Brown had teddy bear mascots with them! And who could forget perhaps one of the most historical figures of our times, who taught so many of us so many wonderful things about friendship - Winnie the Pooh. 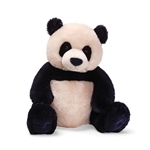 At Stuffed Safari, we work our hardest to provide you with a wide assortment of stuffed teddy bears, including baby safe teddy bears, musical teddy bears, classic teddy bears, brand name teddy bears, affordable teddy bears, jumbo teddy bears, and collectible teddy bears. Scroll down to see our entire collection of teddy bears or use the search box to the left to let our search engine do the looking for you. And don't forget, if you have questions or don't see what you want, we're just a toll free call away!